War Magic | Painted Ponies Everyday Figurines | One Price Low Flat Shipping! 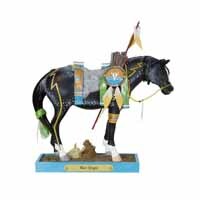 From the Trail of Painted Ponies September 2018 Release, War Magic, Native American tribal horse art figurine. Designed by acclaimed equine artist, Kathleen Moody. Made of stone resin. Measures 6.5" tall. Artistic collaboration is a hallmark of The Trail of Painted Ponies, and War Magic is the first Painted Pony in a new series called the Collaboration Collection. Through color changes and enhancements, and the addition of new religious symbols that add spiritual power to battle decorations, Master Artist Kathleen Moody has transformed War Pony, a tribute to the legendary fighting spirit of the Comanche Indians and The Trails all-time bestselling figurine originally painted by Rance Hood, into a unique and entirely original striking design.